Overwatch's 2019 Lunar Event, The Year of the Pig, is now live – AiPT! Blizzard’s third annual Overwatch New Year Lunar event, The Year of the Pig, has begun and is now live across all platforms. Blizzard has been teasing players for the past week by revealing new skins leading up to the event, which continues until February 18. 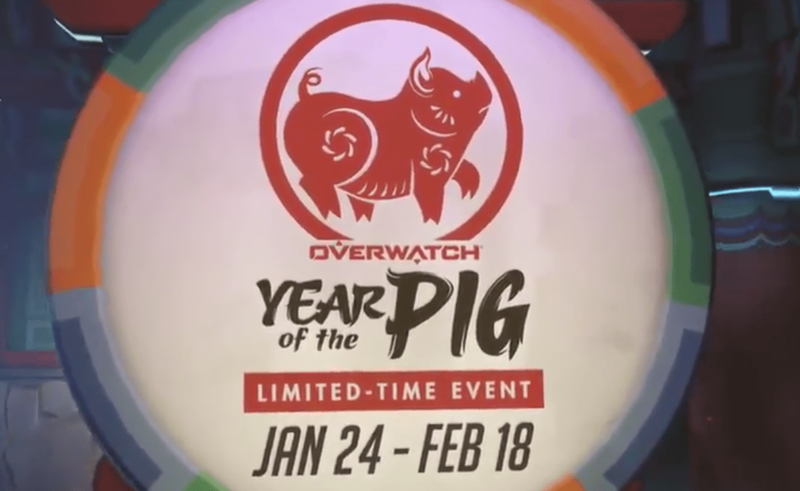 The official announcement of the start of The Year of the Pig came via the Overwatch Twitter account. As with most Overwatch events, the biggest draw for players are the new cosmetic items — mainly the skins. There are five new legendary skins for players to collect this year: Lü Bu Reaper, Guan Yu Reinhardt, Zhuge Liang Zenyatta, Hong Gildong Tracer, Zhang Fei Torbjörn, and Huang Zhong Hanzo. Players can also collect five highlight intros, seven emotes, and a slew of new sprays. As with last year’s Lunar New Year, items from the previous year’s event are available to unlock for a discounted Overwatch credits price. Returning with the event is the Captive the Flag game mode, which includes a competitive mode and will be played on a reworked Busan map. Competitive Capture the Flag includes ten placement matches, leaderboards, and allows players to earn competitive points. Year of the Pig also brings balance adjustments to game-wide mechanics and has D.Va, Brigitte, and Reaper all receiving tweaks. Blizzard believes armor was a bit too strong, and as such damage reduction from armor has been reduced from -5 to -3. “Before this change, armor reduced all incoming damage by up to 5, maxing at half of the normal amount. This change reduces the damage reduction to 3, while still capping at half. This change will be most noticeable for heroes who fire quickly or in bursts, such as shotguns, and do more than 6 damage per shot. For example, Soldier: 76’s Heavy Pulse Rifle will now do 16 damage per shot to armored opponents, up from 14 (an increase close to 15%).” said an Overwatch developer. It’s hard to find a player who isn’t familiar with GOATS and the impact its had on the competitive scene. Brigitte is a mainstay of the GOATS team composition and her Rally ability makes her extremely strong. Rally has been reduced to a maximum duration of 30 seconds, this is designed to limit the snowball effect Rally can often have and make it easier to deal with the increased health of her teammates. D.Va’s Defense Matrix ability has had its cooldown increased from 1 to 2 seconds. This will give opponents the opportunity to better play around the ability and anticipate her actions.